Homes Over $2 Million – 15 Sold Versus 31. 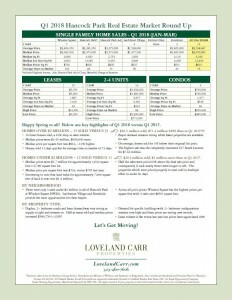 $56.5 million sold, $71.2 million LESS than in Q1 2017! Buyer demand remains strong while fewer properties are available for sale. It’s a great time to sell! Homes Under $2 Million – 12 Sold Versus 11. $20.3 million sold, $4 million more than in Q1 2017. Interesting to note that land value for approximately 7,000 square feet of land is now over $1.4 million. There were only 3 sales under $2 million in all of Hancock park and Windsor Square HPOZs. Larchmont Village and Brookside provide the most opportunities for these buyers. "Janet and Sue were always available for consultation, expert opinion, and moral support throughout our sale. They worked harder than any brokers I’ve ever worked with and, best of all, we sold our house for the price we wanted."